I have always used the Treemap feature in Google Docs to create my Portfolio rectangular breakdown of my stock weightings. I have recently installed Microsoft Office 2016 and I notice they now have a Treemap feature! And it is quite nice. I gave it a spin and here is what I produced. They have a lot more fancier formatting options than Google Docs and I love the colors! The one difference though is that Microsoft Office color codes each sector with their own color. In the Google Docs treemap I have been using for more than a year, I used colors to indicate if a position was more speculative (red) or safe (green). I haven't figured out how to color code it that way and also have it group the sectors together. I'll post a tutorial soon on how you can make your own graphs like this shortly! 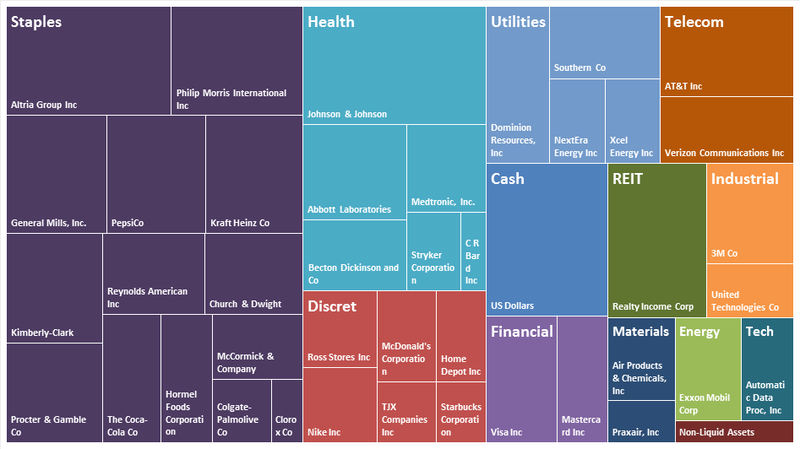 The new treemap looks pretty cool to me - easier and much cleaner to read. Thanks for sharing.